Rules changes, safety measures and spread offenses have forced coaches to overhaul their approach to one of the most elemental facets of football: tackling. But at the top programs in the nation, opinions differ on the best method. Washington defensive coordinator Pete Kwiatkowski can rattle off the commands: Head across. Eyes through the near number. The game hasn’t given Kwiatkowski and his peers much choice but to evolve. 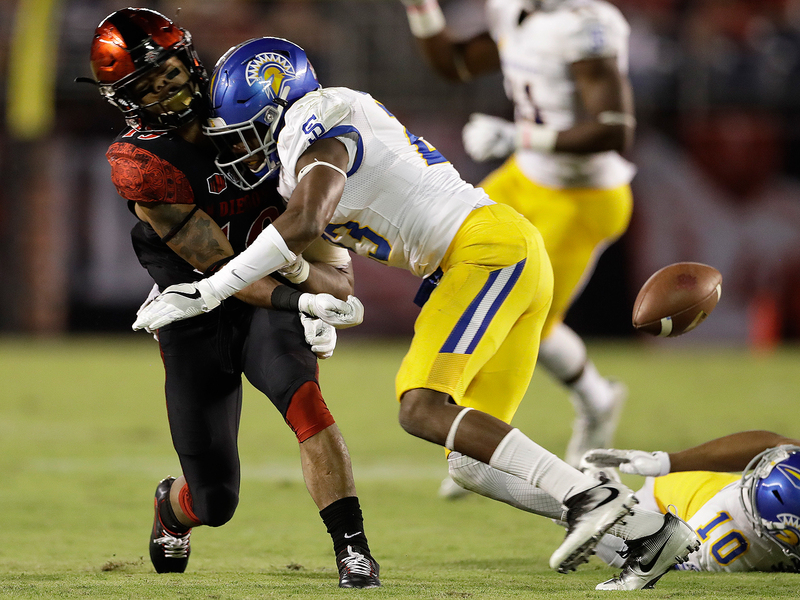 Concerns over head injuries prompted the 2013 targeting rule that can get a tackler thrown out of a game for contacting a defenseless player above the shoulder or for leading with the crown of the helmet. Offensive schemes have also spread the field, which means missed tackles have a greater chance of turning into touchdowns. But while the incentives for sound, effective tackling have never been greater, under a variety of recent safety rules players have less time than ever to practice in pads and master new techniques. That’s why Rocky Seto, a former USC and Seahawks assistant, wound up studying how rugby players tackle while working for Pete Carroll. It’s why Tennessee defensive coordinator Bob Shoop invented drills last season that would allow his banged-up defense to maintain some semblance of tackling fundamentals. It’s also why Baylor equipment director Jeff Barlow received new marching orders from first-year coach Matt Rhule: Go buy some robots. 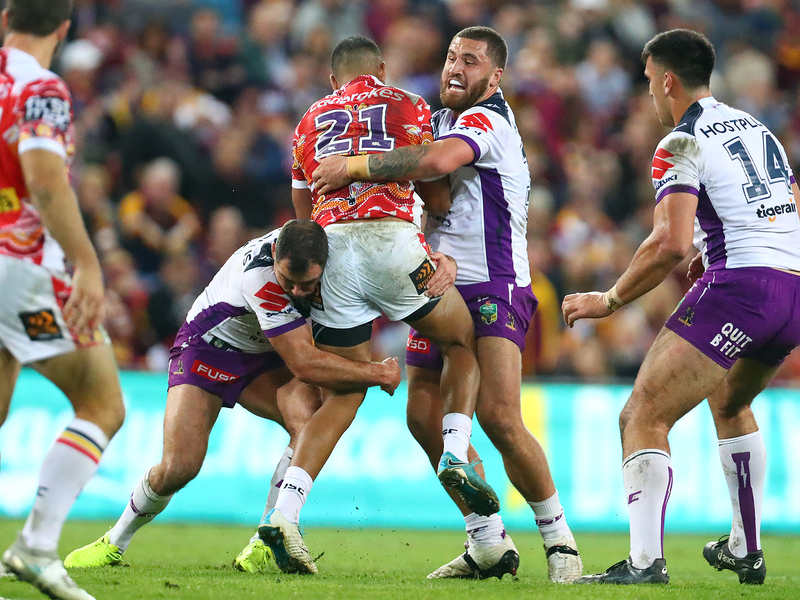 Old-school tackling methods just as aiming the 'eyes through the near number' are falling out of fashion as injury awareness rises and targeting penalties become commonplace. Defensive coaches are as passionate about their tackling methods as gumbo cooks are about their roux. And just as those chefs have definite ideas about the use of butter and flour, defensive coaches are adamant about the tackle’s key ingredients: where to make contact and how to bring down the ballcarrier. Then, in the late 2000s, new medical data about the long-term dangers from head injuries encouraged coaches to further rethink their approaches. Now, nearly every one agrees that the tackler’s shoulder should hit the ballcarrier first—just as it did in the days before seemingly indestructable face masks. What coaches can’t agree upon is where that shoulder should land and what should happen next. Alabama coach Nick Saban played defensive back at Kent State in the early 1970s, when tacklers mostly led with their shoulders. Saban has always taught defenders to track the near hip, plow a shoulder into the ballcarrier's near shoulder, wrap him up and drive him to the ground. This allows for a chest-high hit while keeping the head out of the tackle. The approach has proved remarkably effective. According to data tracked by Pro Football Focus, Bama has been the nation's second-most-efficient tackling team over the past three seasons, behind Air Force. The Crimson Tide had 1,845 tackles and 437 assists with only 273 missed tackles, well below the FBS average of 349.6 during that span. When Saban sees coaches teaching defenders to send their shoulders into the thigh, he wonders how a tackler can generate power while bending that low. “There’s no game that anybody plays bent at the waist on their toes,” Saban says. The Seahawks bought his pitch and even released an instructional video on their rugby-style tackles before making a second straight run to the Super Bowl in 2014. The hawk drew the most media attention, but coaches also took notes on the profile tackle (a shoulder-to-chest tackle, which Saban would prefer) and the compression tackle (a two-on-one tackling method, usually with a combination of a hawk and a profile). More college teams are teaching defenders to lead with the shoulder, as rugby players often do. No matter the technique, the challenge every FBS coach faces now is finding a way to teach it. In 2015, the Big 12 began limiting its teams to one full-contact practice a week during the season. Last year the Ivy League ceased full-contact practices altogether. This year the NCAA banned two-a-day practices. And sometimes coaches simply don't have enough healthy players to risk hitting much in practice. By mid-October, Tennessee’s Shoop had lost four starters for the season and had three others sitting with injuries. “Our Achilles heel was giving up a lot of big plays,” he says. “Some of them were because of missed tackles.” So Shoop had his players drill more on their footwork and positioning, which can help solve issues that lead to extra yards. Lunging to hit from too far away, for instance, can cause a missed tackle just as often as a poor wrap-up or minimal leg drive. Norris was the coach at Kentwood (Wash.) High for 11 seasons before he left in 2015 to marry his first sporting love with his second. He had discovered rugby at Arizona State in the 1980s, and he had coached it at the youth level when he wasn’t coaching football. Norris now serves as head of football at the ATAVUS rugby and football academy in Seattle, and he consults with high school, college and pro teams about the science of tackling. Working with Kwiatkowski and schools including Michigan State and Rutgers, Norris studies tackling data and video and helps coaches design practice plans that focus on the facets that need sharpening. Norris and Seto agree that coaches can drill players on the finer points of tackling with no pads involved at all. Simply working on tracking the ballcarrier’s near hip—as Alabama players do nearly every day—helps players be in far better position to make the tackle. Also, no contact is necessary to perform footwork drills that ensure the tackler’s near foot is staggered in front so he can adjust if the ballcarrier changes direction. Kwiatkowski has a rule at his practices that tacklers are not allowed to “tag off” ballcarriers in noncontact situations. The defender must work through every step of the process until the point at which he would make contact. Equipment innovations have also helped coaches drill technique without making players drill one another. Tackling dummies still exist, but new products are available at every price point. One of the simplest is the Tackle Wheel, a foam donut as tall as five feet that a coach can roll down the yardline. Hawk tacklers work on shoulder-to-thigh contact by hitting it, then practice spinning the donut to the ground as they would a ballcarrier. The Shadowman, meanwhile, is a dummy with clearly marked strike zones for the chest and thighs. It sits inside a rubber ring that slides along the ground and has a harness attached. As a coach pulls the ring, the tackler must track the moving dummy, hit it with the proper shoulder and drive it in the right direction. A solid hit will pop the dummy off the ring and onto the ground. The Shadowman doesn’t offer the resistance of a real ballcarrier, but it does force the tackler—who can wear full pads or just a helmet—to approach correctly and hit the proper strike zone. Schools with a heftier budget can afford more advanced options. When Rhule arrived at Baylor from Temple, he wanted to teach his defenders to blast ballcarriers in the chest. “If you want to cause turnovers and knock people backward,” he says, “hitting them low doesn’t really do that.” So Rhule asked his equipment director, Barlow, to find a device that would allow the Bears to simulate a game-speed tackle. Barlow called Baylor’s sales rep at dummy and blocking sled-maker Rogers Athletic. The rep recommended the MVP-DRIVE—the MVP standing for Mobile Virtual Player—based on a device pioneered at Dartmouth, where coach Buddy Teevens banned live tackling in practice in 2010. He ultimately replaced human ballcarriers in some tackling drills with a self-righting, motorized dummy designed by students in the school's engineering program. Now Rogers has similar devices on the practice fields at Texas, Notre Dame and Georgia, and in NFL camps. Whether a team uses a robot, a foam dummy or noncontact drills, the goal remains the same: Execute one of football’s two fundamentals. The team that figures out how to do that in the safest, most efficient manner could rule the sport.